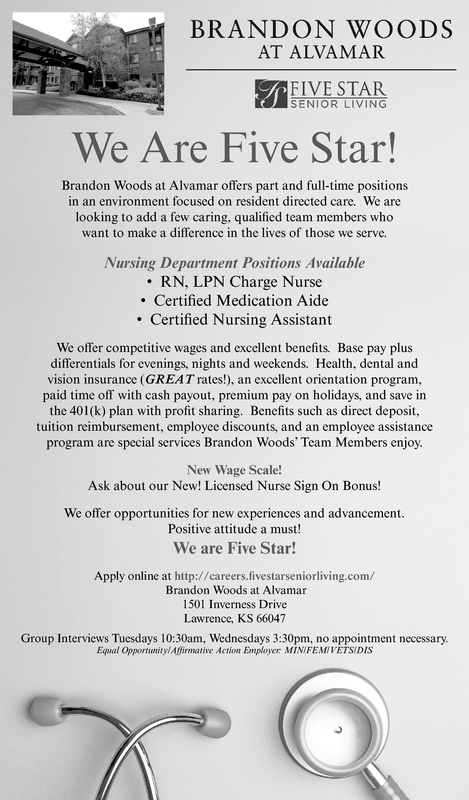 Brandon Woods at Alvamar offers part and full-time positions in an environment focused on resident directed care. We are looking to add a few caring, qualified team members who want to make a difference in the lives of those we serve. We offer competitive wages and excellent benefits. Base pay plus differentials for evenings, nights and weekends. Health, dental and vision insurance (Great rates! ), an excellent orientation program, paid time off with cash payout, premium pay on holidays, and save in the 401(k) plan with profit sharing. Benefits such as direct deposit, tuition reimbursement, employee discounts, and an employee assistance program are special services Brandon Woods’ Team Members enjoy. Ask about our New Licensed Nurse Sign-On Bonus! We offer opportunities for new experiences and advancement. Group Interviews Tuesdays 10:30am, Wednesdays 3:30pm, no appointment necessary.